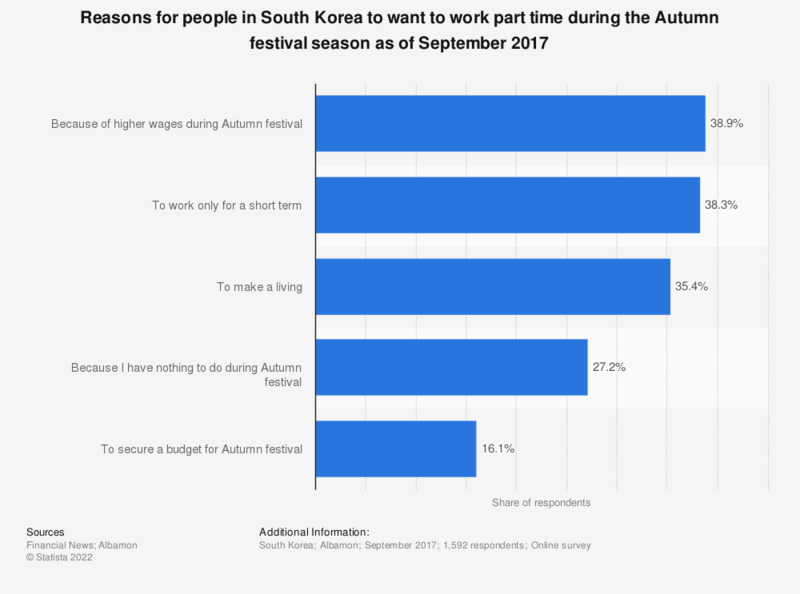 This statistic shows the reasons for employees, undergraduates and part time workers in South Korea to work part time during Autumn festival holiday season as of September 2017. According to the survey conducted among 1,592 employees, undergraduates and part time workers, the most significant reason for them to work during Autumn festival was higher wages. Original question: "Would you be willing to work part time during the Chuseok holidays? If yes, why do you want to work part time during Chuseok?" Sample group of this survey consisted of employees, undergraduates and part time workers. Among 1,592 respondents who were surveyed, 62 percent responded with "yes".